Whether as intelligence (as in artificial intelligence, or AI), evolution (as in artificial evolution), empathy (as in artificial empathy), culture (as in artificial culture), or even life (as in artificial life, or ALife)—to name a few—the artificial is expanding to such a degree that a future dominated by computers, or any other machine, is no longer only a subject of science fiction [cf. Kurzweil (2000, 2006)]. In The Sciences of the Artificial, Herbert Simon’s (1969) very lucid attempt to address the notion, he correctly cites dictionary definitions: artificial as in â€˜â€˜produced by art,’’ which means through skill rather than by nature; in other words engineered, which implies an engine, or machine-based making. Simon came from the classic tradition in which Plato’s (cf. Philebus) distinction between the true, the beautiful, and the good, led to the definition of the natural sciences and the social sciences (aesthetics and ethics included). His viewpoint is couched in the German arguments over methodology (Methodenstreit, ca. 1880–1890). The latter forms the background against which he articulated his own views and concepts. The reason for revisiting Simon’s contribution is not so much to identify its foundation [and echoes from Windelband’s (1894) Geschichte und Naturwissenschaft and Dilthey’s (1883) Einleitung in die Geisteswissenschaften], as it is to identify its fundamental weakness. In Simon’s view, natural science pertains to â€˜â€˜objects or phenomena in the world.’’ Its task is to â€˜â€˜show that complexity?is only a mask for simplicity,’’ assuming— and this is the critical aspect—that they are â€˜â€˜correctly viewed,’’ (1969, p. 1). Thirty-three years later, this view was echoed in Wolfram’s (2002) â€˜â€˜new kind of science’’ in ways in which simple mathematical descriptions suffice for generating complex behaviors as computations. This means that objects or phenomena in the world are viewed from the reductionist-deterministic perspective upon which the natural sciences are based. Simon generalized to the aesthetics of natural science and mathematics, â€˜â€˜at one with the aesthetics of music and painting,’’ concluding, â€˜â€˜both inhere in the discovery of a particularly concealed pattern.’’ In Simon’s view, the path from complexity to simplicity is the same in the natural sciences as in aesthetics. Indeed, the reduction of complexity and the cause-and-effect sequence constitute the very foundation upon which natural science has been practiced ever since Descartes and Newton. The cause-and-effect sequence is itself a reductive model in which time is equated to interval. But the same cannot be said of aesthetics, reflecting upon artifacts not actually resulting from a cause-and-effect sequence of actions. In building on these premises, Simon was extremely successful in his work. His very precise observations regarding the semantics of the notion of artificial are indicative of an understanding of a new gnoseological condition of humankind. Men-made (he precludes the gender correctness police, using men as â€˜â€˜an androgynous noun, encompassing both sexes’’) is practically synonymous with artificial, and as such replaces the natural at an ever-increasing rhythm. The new corn and cattle (his examples) are â€˜â€˜artifacts of our ingenuity;’’ the new farm is as artificial as a highway. His focus is on â€˜â€˜means for relating the natural and artificial,’’ in particular, on economics, psychology, and design. The â€˜â€˜artifact as an interface’’ (Simon 1981, p. 6, 113) is but one example of what the reductionist-deterministic foundation can afford. 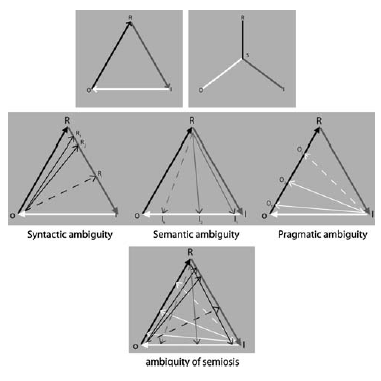 I myself benefited from this idea of Simon’s as I developed a semiotic foundation for human–computer interaction [cf. Nadin (1988)]. Still, the premise, as mentioned above, upon which he builds, and which undergirds the Industrial Revolution, as well as its extension into our age, is flawed. To make this point, in order to more adequately address issues pertinent to aesthetic and ethical aspects of artificial intelligence (and, by extension of the entire realm of the artificial) requires revisiting the distinction that informs his entire endeavor—natural sciences vs. the sciences of the artificial—and connecting to the very generous thought regarding the symbolic, i.e., how we perceive the world and share this perception with others. Simon was well ahead of his contemporaries in realizing that the semiotic dimension of human activity eventually provides the bridge that joins the natural and the artificial. What he does not realize is that the more profound distinction, from which his research would have benefited, is the one between the living and the physical—that part of reality which is not alive, not endowed with life. The reason is obvious: Descartes and his followers eliminated from philosophical and scientific discourse the so-called force vitale [cf. Bergson (1907)], that is, the doctrine of vitalism, thus establishing the mindset for all future scientific endeavors, down to this age. Our own concern with the aesthetics and ethics of technology cannot, however, limit itself to the distinction aptly pursued by Simon. Neither aesthetics nor ethics is definitory of natural sciences or of the sciences of the artificial. They are, not unlike other constructs—I refer here to numbers, geometric entities, tools, etc.—constitutive of human existence, in the absence of which technologies would be difficult to imagine. By this, I mean that these constructs not only describe the world in which they are elaborated, including our modern world, but they actually partake in our making of the world, as we change it and ourselves in the process. For the sake of clarity, aesthetics is defined in this study as pertaining to human existence (work, leisure, life) characterized by sensori-emotional aspects commonly associated with beauty (as a particular form of expression) or other formal qualifiers. My entire involvement with aesthetics (going back to a doctorate in the subject) was informed by Baumgarten’s Aesthetica, i.e., defining aesthetics as the science of sensory experiences. Further shaping the view of aesthetics adopted here is Schiller’s attempt to see aesthetic appreciation as the reconciliation of the sensory (sensual, as some would put it) and the rational aspects of human nature. As technology supporting new forms of expression (visual, aural, multimedia, virtuality, etc.) evolved, aesthetics became part of almost every practical experience, from labor, to acquisition and dissemination of knowledge (Nadin 1991a, b, 1995). As far as ethics is concerned, maybe Spinoza is the reference I should start with. Life worth living would be the short description of the concept as I pursue it in these pages. To achieve the good with awareness that it is right is a path that leads back to Socrates. In what I call the selfconstitution (a notion closer to Maturana and Varela than to Aristotle’s self-realization) of the human being through everything we do and are involved in [cf. Nadin (2003b)], individuals become aware of all that affects their existence. Knowledge of the self is the premise of actions guided by ethics. Finally, awareness is the ability of the living to relate to its environment without necessarily understanding it. Self-awareness, i.e., awareness of one’s own awareness, corresponds to realizing the distinction between the self and similar entities. Defined, albeit succinctly, the concepts that I will operate with integrate the understanding that in the dynamics of the living—from the simplest forms to more complex organisms—both aesthetics and ethics emerge only above a certain level of complexity; that is, they can be associated only with the human being, even when the human being â€˜â€˜sees’’ aesthetics and ethics in all forms of life. Evidently, technologies are an expression of human creativity. They are instantiations of human knowledge acquired as we pursue the goal to replicate the complexity of life itself. (That many other factors are involved in the development of technology is very well known.) Therefore, artificial intelligence cannot avoid the seduction of reaching for and eventually attaining the intelligence of the living—or even exceeding it. By no means does this description imply that the living—from the simplest to the most complex—and the intelligent—with different forms of expression in different living forms—are the same. Similarly, artificial evolution, artificial empathy, artificial culture, artificial life, and all the other disciplines of the artificial can be seen as in a sui generis competition with natural evolution. All these challenge the domain of human-experienced emotions, of human culture—as an aggregate expression of individual definition in a given context. The various disciplines of the artificial challenge life itself through whatever a better or more meaningful or more resilient artificial life could be. Taking note of this inescapable condition, we cannot avoid wondering at what moment the drive to embody our knowledge of the living (intelligence, emotion, culture, etc.) in a technologically generated alternative (replica or even substitute) leads to an alternate world. In simpler terms: when does the replica, i.e., the imitation of life, become the real thing, a new form of life? Synthetic life, the current research focus in the life sciences, attempts to transcend the level at which we decipher the genetic code and write genetic programs that drive artificial entities. Again, for the sake of clarity, let us define the synthetic. Between artificial life and synthetic life, there is a difference that few, even well-educated members of the research community, understand, and that even fewer find significant. Artificial life (A Life, as it is known) is the result of the art of mathematicians and computer programmers, in which analytical skills are used in order to give adequate representations of life-like dynamics. It is a top–down approach of the nature of applied analysis. Synthetic life is the attempt to synthesize life. It means make life (if possible) from the bottom up, from whatever it takes to put it together. In this sense, it is useful to realize that the concept of synthesis—usually understood as combining pre-existent entities with the aim of making something new—deserves to be used no less than any other concept within the ethics of terminology for which Peirce (1903) argued. Indeed, the sequence thesis–antithesis– synthesis—which Fichte (1998) famously spelled out (although it was infamously attributed to Hegel)—should guide all scientists who lay claim to synthesizing whatever they synthesize. Synthesis is the process of uniting opposites [cf. Croce (1906), who should have known better about Hegel]: â€˜â€˜The synthesis of opposites expresses life and not the corpse of life.’’ Even for those less than familiar with the epistemological framework within which synthesis is defined, it would be easy to realize that artificial sounds, for example, are not the same as synthesized sounds. Photo synthesis, as a particular form of synthesis, is the process of converting non-living elements into living entities with the help of the energy of light. Synthetic life, as the current infatuation with the subject has it, is the attempt to write new genetic code, to animate—I choose this word on purpose—a synthetic chromosome. Is this a matter of the degree to which life and non-life (the physical) are different? And if they are—which is a statement I will elaborate upon—what are the necessary conditions for the synthesis (unity of opposites)? Conditioned by the education that formed us—the reductionist- deterministic rationalism of Descartes—do we even accept that they are different in nature? The question is too important for our understanding of some of the implications of aesthetics and ethics as related to synthetic life. Let me use an example in order to explain what I am driving at. Stanley Kubrick created a metaphorical story (inspired by Brian Aldiss’s short story, Super Toys Last All Summer Long, written in 1969). It eventually became the movie, AI: Artificial Intelligence (2001) directed by Steven Spielberg. The story is about a boy android capable of emotion (talk about the artificial empathy project!) who wants to have the love of his mother, that is, the woman who acquired him to replace her living son (in suspended animation until a cure for his disease could be found). In a 1971 interview, Kubrick formulated the question regarding the difference between the natural and the artificial: â€˜â€˜One of the fascinating questions that arises in envisioning computers more intelligent than men is at what point machine intelligence deserves the same consideration as biological intelligence.’’ He went onto say: â€˜â€˜Once a computer learns by experience as well as by its original programming, and once it has access to much more information than any number of human geniuses might posses?you could be tempted to ask yourself in what way is machine intelligence any less sacrosanct than biological intelligence?,’’ [cf. Walker (1971)]. The Mechas, as the companion robots are called in the story (and in Spielberg’s movie) correspond to this high level of imitation of life through machines. It seems that only the desire to be loved cannot be fulfilled. Love implies, of course, some aesthetics; it is the substratum of attraction, since seeing and perceiving the world is part of the underlying sexuality characteristic of the living. David, the boy android, is beautiful in looks and character, attractive, of course, but not necessarily from the viewpoint of sexuality. Several ethical aspects are brought up: what does a mother do with an artificial child whom she happens to like? How does society discard machines that are human in many aspects? (The movie seems to purport that they are better than humans.) Even more: how seductive should technology be? In his mechanistic understanding of the living, Kubrik is at one with Descartes [and even more with de la Mettrie (1747)]. Moreover, Kubrik, not unlike many cognitive scientists and computer experts, never came close to realizing that experience and learning are quite different from even the most advanced programming, including artificial learning (defined as computable). More precisely, the living, sacrosanct or not, displays adaptive characteristics, usually labeled as intelligent. However, intelligent behavior is fundamentally different from machine intelligence. Just for the sake of argument, let us imagine that the project synthetic life—genetic code giving life to a synthetic chromosome—eventually results in the synthesis of the physical (material substratum) and the animate. Will this life enter the dynamics described in evolution theory? If yes, at which rhythm will it evolve into synthetic Mechas— not robots, but synbots—impossible to distinguish from the natural? The mother in the movie, in which the synthetic replaces the artificial, could actually consume her love. The perspective of discarding the synthetic son would disappear. If this, more than the prose that inspired Kubrik, seems closer to literature than to current developments in science and technology, it is only because today fewer people read GÅ“the’s Faust than they read manuals for programming or for running some of the many machines we have the opportunity to use (or are forced to use). The subject preoccupied many authors and evinced many conflicting positions. The journal Science has, since 1880 [cf. Barker (1880); Vaughn (1909); Schaefer (1912); Wilson (1923) and more recently Marcus (2004); Rasmussen et al. (2004); Jan and Jan (1921)], hosted a great number of position papers, reviews, and editorials on the subject of What Is Life? So did Nature (1929), where Schrödinger’s eponymous book occasioned many articles [Perutz (1987); de Duve (1996); Davies (2005)]; and where Aleksander (2004) envisaged the domain â€˜â€˜Beyond artificial intelligence’’; and Benner (2008) reviewed Regis’s book Investigating the Nature of Life in the Age of Synthetic Biology. For reasons I am unable to understand, Rosen’s (1991) Life Itself and the posthumously published Essays on Life Itself (2000) has not attracted the attention that the very subject seems to enlist. The initial limiting causal determinism affirmed in books and articles was replaced by more nuanced understandings (in Rosen’s case, by a definite new perspective). One of such understandings corresponds to the realization, after Boltzmann’s work on entropy was published in 1872, of the role that energy exchange plays in the natural world. The dynamics of all there is, how things change, whether the human being or mountains, or rivers, remains the expression of forces at work, and of energy processes (the laws of thermodynamics from which even our notion of information processes will eventually be derived [cf. Shannon (1948)]. Based on these premises, technologies were and still are conceived, produced, and deployed as agents of change in the service of the human being. To miss the opportunity of acknowledging how the Cartesian revolution eventually led to the Industrial Revolution and to our Post-Industrial age, would be at best ridiculous (actually it would disqualify any attempt to look beyond it). But the same holds true for failing to notice that what used to be an opportunity—the understanding of the world from the perspective of Cartesian rationality—became, as we grew captive to it, a fundamental obstacle in understanding what lies beyond the boundaries of the gnoseological territory it describes. As we shall see further, in detail, these boundaries are set in the realm of complexity. The understanding of complexity as threshold between the living, even in its elementary forms, and the physical marks the departure from the stubborn reductionist scheme. After all, the aesthetic and the ethical, the subject of discussion here, correspond to the level of complexity in which the living is couched, although they are constructed by the living in its most complex forms of existence, i.e., they are human constructs. By extrapolation, we can talk about the beauty of storms, stars, and oceans, as we talk about the beauty we see in nature and at times associate with its evolution. We can as well introduce ethical considerations in respect to how human beings relate to their physical environment. Current discussions on ecology and sustainability are exactly the expression of such considerations. But the dynamics of the physical, or of life forms less complex than the human being, is neither aesthetic in itself nor ethical. Once human beings relate to this dynamics, their own aesthetics and ethics are projected upon the physical, or upon the living as we encounter it in our own existence. Even more interesting, once the human being skillfully expands the physical through artificial entities—which can be machines, programs, artworks, etc.—this expansion entails aesthetic and ethical considerations. It is worth considering aesthetic and ethical consideration of the synthetic as well, since, after all, our own identity is projected in the synthesized world we are making possible. 11 Gödel’s first incompleteness theorem, perhaps the single most celebrated result in mathematical logic, states: Any effectively generated theory capable of expressing elementary arithmetic cannot be both consistent and complete. In particular, for any consistent, effectively generated formal theory that proves certain basic arithmetic truths, there is an arithmetical statement that is true, but not provable in the theory. The incompleteness theorem first appeared as â€˜â€˜Theorem VI’’ in his 1931 paper On Formally Undecidable Propositions in Principia Mathematica and Related Systems I. In Gödel’s original notation, it states: â€˜â€˜The general result about the existence of undecidable propositions reads as follows: â€˜Theorem VI.’ For every x-consistent recursive class j of FORMULAS there are recursive CLASS SIGNS r, such that neither v Gen r nor Neg(v Gen r) belongs to Flg(j) (where v is the FREE VARIABLE of r)’’. ?mathematical objects have an independent existence and reality analogous to that of physical objects. Mathematical statements refer to such a reality, and the question of their truth is determined by objective facts which are independent of our own thoughts and constructions, (1986–2003, pp 30–31). Aesthetic objects or ethical constructs, similar to mathematical objects, also have such a condition of reality. (And so do other philosophical entities). They refer to reality, and questions of their relevance (works of art are neither true nor false; ethical statements are also quite different form mathematical or logical concepts) are related to actions and facts, not to the result of our thinking or of our constructs. This is important because at this juncture, we could, as well, give up the hope of achieving complete and consistent knowledge about the world in its complementary unity (i.e., as living and nonliving). Complementarity—to which we shall return—is a principle that ascertains that an entity can have contradictory characteristics. Although they are always present, we cannot perceive them in their togetherness, but rather one at a time. Something—light, or the electron—being both a particle and a wave—both simultaneously— appears to observers as either particle or wave, depending on the situation. The living is yet another example of a concept suggesting the complementarity view. More detail about this will be provided as the argument advances. Alternatively, we could proceed along the line of a reductionist path: if the whole cannot be known completely and consistently, is it not the case that parts of it could afford us descriptions that are non-contradictory and complete? (Fig. 1). Below the threshold of complexity that defines life, that is, in the section we defined as the physical, the Cartesian view and method, to which Kubrik, like so many others, adhered, define reality both in a complete and consistent manner. This is what physics is about. The artificial belongs to this domain of reality. Above the threshold, that is, in the domain of the living, the Cartesian view and method are at best incomplete, if not wholly inadequate. Quantum mechanics already challenged not only physics at the micro-level, but also biology. Although the living is matter and life, we cannot perceive them in their togetherness and provide a full and consistent account of the behavior of the living. Of course, these statements concerning our ability to understand the living and the nonliving in their unity will not go unchallenged. It is my own position that they should not be accepted at face value unless and until they are as rigorously submitted to evaluation at least as much as Cartesian thought was. Gödel dealt specifically with formal systems, and I am not convinced that he would have automatically endorsed the gnoseological operation of dividing the whole that he examined (formal systems) into conveniently defined sections that can be described wholly and free of contradiction. But the procedure as such is at least suggestive, if not directly effective for the purpose pursued in this paper. In view of this procedure, let us first state that matter embodied in living forms is not different from matter making up the non-living. Neither is energy involved in the living different from the energy in the physical world. This is a continuum premise for the complementarity view of the living and the physical. It is fully confirmed by science and it makes no sense to question it. In the rest of this article, I will label the non-living as simply â€˜â€˜the physical.’’ Since physics (and its many extensions in particular sciences, such as chemistry, geophysics, molecular biology, etc.) provides an adequate description of the dynamics of physical reality; and since such descriptions proved, so far, to be of high predictive relevance, I will always assume that the physical behavior of a living entity is adequately, even if at times only partially, described by physics. Indeed, a falling stone and a falling human being are well described through the laws of gravity. But while the stone has no say in the matter (to use a bit of anthropomorphic language), the falling of a person involves, in addition to gravity, some choice. Through such choice, the falling individual prevents hurt, most of the time. We will get back to this example as the development of the argument requires (Fig. 2). Though this does not explain the difference in payment, it suggests, at least, that there are simple machines (cars, computers) that, although intended to be dynamic entities, are perfectly understandable within the reductionist framework since they are, after all, products of this perspective. We can fix them as they stand still, and, as a matter of fact, we prefer to have them brought to a standstill. Their complexity, not to be discarded or played down, is such that the parts can be identified and fixed as necessary, or replaced. But once we transcend the threshold of the complexity that defines a simple system, and by extension, simple machines [Rosen (1985a, b) introduced this notion], the possibility of reducing them from the functioning state (living, to be more precise) to the standstill state (in plain English, killing them, since cryogenics has never succeeded in returning a being to life after it was frozen) without fundamentally affecting their condition no longer exists. Heinz von Foerster (1993) distinguished even more expressively between trivial machines—which produce the same results no matter how often the input is fed into them—and non-trivial machines, which are historically conditioned; that is, they learn, forget, and change (Fig. 3). The repair of the living is the result of living itself, subjected to some external influence (such as the doctor’s intervention in the anecdote), to interactions, but not necessarily reducible to them. Again, Rosen, with his (M,R)- systems (i.e., characterized by metabolism and self-repair), defined the living as having its own implicit dynamics, while the dynamics of the physical is the result of external forces. Rosen (1966) was fundamentally opposed to von Neumann’s understanding of the threshold of complexity, bringing up the need to account for the characteristics of the organism as evolvable. Nevertheless, in hindsight we can say that both realized, although in different ways, that if complexity is addressed from an informational perspective, we end up realizing that life is ultimately not describable in algorithmic terms. Non-algorithmic selfassembly (epigenetic progresses) is of such a condition that it does not require either full descriptions of the functions or of the information involved in living processes. Indeed, the doctor in the anecdote—as opposed to the mechanic— most of the time operates on relatively poor subsets of information when addressing deviations (headaches, temperature, change in skin color, etc.) from a normal condition. In the absence of complete genetic instructions, or better yet, on account of incomplete instructions, the distinctive characteristics of the living are maintained. Actually, to go a step further, the information is not only incomplete, but ambiguous. Given the implications of this observation, we need to give it a bit more attention. Along the line of the Church– Turing thesis—i.e., that every physically realizable process is computable—von Neumann went out on a limb and stated, â€˜â€˜You insist that there is something a machine cannot do. If you will tell me precisely what it is that a machine cannot do, I can always make a machine which will do just that’’ (1963). If von Neumann was convinced that telling precisely what it is a machine cannot do— emphasis on precisely—is a given, he was not yet disclosing that telling precisely might after all require infinite strings, and thus make the computation to be driven by such a description impossible. Actually, von Neumann should have automatically thought of Gödel in realizing that a complete description, which would have to be noncontradictory, would be impossible. Descriptions, in words (as he expected, cf. â€˜â€˜anything that can be completely and unambiguously put into words?.’’), or in some other form, are, in the final analysis, semiotic entities. They stand as signs for something else (the represented), and in the interpretant process, we understand them as well defined or ambiguously defined [cf. Nadin (1988)] (Fig. 4). A sign is something that stands to some one for some thing in some form or capacity [cf. Peirce (1931–1935)]. The two diagrams represent two views: on the right, the sign as a structure S = S(O,R,I) and on the left, the sign as process that starts with a representation (R of O) to be interpreted in a sign process (semiosis) that connects the representation to the object. 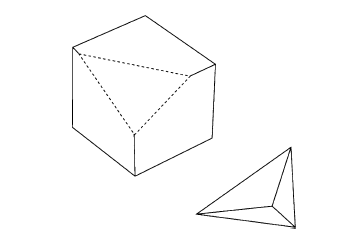 Often the same object can be represented by different Rs; or some representations can be associated with an object other than that initially represented. Some signs are well defined; others are less well defined. The majority (what we call symbols, i.e., representations adopted by convention) are ambiguous in various degrees. At this point, it is useful to inject yet another suggestion. This pertains to the distinction between matter and information, which, as we know, eventually led to the distinction between symbolic descriptions (which I prefer to call semiotic descriptions) and the dynamics of self-replication. When I defined the computer as a semiotic engine (1985, 1988), I had in mind the fact that, as opposed to the nonliving (i.e., physical), the living is an entity defined through interaction. Most of the time, the interaction is mediated through signs. Moreover, the living receives external information through its sensory channels (sounds, images, tactile information, etc.) and associates it with objects or phenomena in the world. At the same time, the living generates its own information [cf. Klaus Fuchs-Kittovski (1968, 1976)]. We â€˜â€˜hear’’ and â€˜â€˜see’’ and â€˜â€˜smell,’’ etc. what is not out there, but represented in our cognition by the information we generate based on our experience [cf. Nadin (1998, 81–86)]. I bring this up not in order to mark my territory [computers as semiotic machines, cf. Nadin (2005)], but rather to suggest that our focus should be on what is processed in the living, and not so much on the processing substratum (molecular and sub-molecular processes). The information from the environment is received through the senses. It can be measured, and was indeed measured. Representations of the world, not fragments of the world, are actually processed. Until the development of brain imaging, we could not capture the change from sensorial energy to the representational level. And even with images of the brain, we still cannot quantify semiotic processes. It is the re-presentation of things, not things themselves, that are subject to processing and understanding. Re-presentations are renewed presentations as signs; that is, attempts to associate a sign to an object and to conjure the consequences that the sign might have on our activity. Re-presentations can be of various degrees of ambiguity—from very low (indexical signs, as marks left by the object represented) to very high (symbols, i.e., conventions). Lightning arouses a sense of danger associated with phenomena in the world. The black cat brings up false associations (superstitions) with dangers in the world. They are of different levels of ambiguity. The living can handle them quite well, even if, at times, in a manner we qualify as irrational. Machines operate also on representations, provided that they are unambiguous. For this reason, we conceive, design, and deploy artificial languages of zero or very low ambiguity. The living operates, most often effectively, with representations regardless of their ambiguity. The machine is â€˜â€˜protected’’ from ambiguity. (We endow machines with threshold identifiers: is the ignition turned on or not? Intermediate values do not count! Ambiguity is a source of error in their functioning.) Von Neumann’s claim that he could conceive a computation for any precisely described entity means nothing more than that he proceeds to segregate between the semiotic of the unambiguous and the semiotics of ambiguity. The impossible—processing of ambiguity in simple machines—takes a â€˜â€˜little’’ longer (â€˜â€˜little’’ meant here as an irony); that is, it is intractable. With all these preliminaries in mind, we are now in a better position to understand that at the level of simple machines, there are aesthetic and ethical implications that transcend the concerns of their designers, manufacturers, operators, and technicians. It is not only how machines look, how they relate to other aesthetic aspects of reality, and how they embody ethical standards. Such simple machines operate in the interval domain of causes and effects, in a non-ambiguous manner. The car transports us from A to B under clear assumptions (ignition on, energy use, efficiency, available roads, traffic laws all accounted for). And the computer can process all kinds of data, provided that we define a computable function that describes unambiguously the process of our interest. However, neither their aesthetics nor their ethics can be reduced to the cause-and-effect sequence, and even less to non-ambiguity. Processes leading to aesthetic expression or to aesthetic artifacts (to like something, to be touched by something, to make something that is liked in view of its characteristics, etc.) are not computable because they are not precisely describable. We can generate computer artifacts that qualify socially as art, and are traded as such, but the ambiguity is handled by the artist, either in using a program or in writing one [such as Cohen’s Aaron (1982)]. On the other hand, we become involved in ethical activities (noticing beneficial patterns of behavior or interaction, formalizing observations of what is right or wrong, etc.) in order to contain ambiguities inherent in human expression. In both cases, cause-and-effect sequences are at best epiphenomena. What drives aesthetic patterns of activity (rhythmic movements, harmony, sense of shape and color) are anticipated consequences: a rhythmic movement is less tiresome; harmony supports longer time efforts; various shapes and colors enhance the outcome of work. The same holds true for ethics. As constructs, aesthetics and ethics embody expectations of a very precise nature, although always context dependent. Once we reach the threshold of complexity at which causality itself is no longer reducible to determinism, and the condition of the living integrates past, present, and future, a new form of adaptive behavior and of finality emerges that makes aesthetic awareness and ethical imperatives possible, and indeed necessary. If the living is characterized by its high complexity, so are the various practical experiences through which aesthetic awareness and ethical expectations are expressed. As deficient as the traditional vitalist explanations of the living were, they accounted for evolution and the adaptive capabilities that correspond to evolution. Walter Elsasser (1987) gave a good description: â€˜â€˜the idea that the laws of nature need to be modified in organisms when compared to inanimate nature is known as â€˜vitalism’.’’ He repudiated vitalism and attempted to elaborate a foundation of biology by extending the foundations of physics—his domain of expertise. Let us not ignore the fact that Niels Bohr expressed serious doubts about understanding the realm of the living by using the explanations of reality delivered by physics. Schrödinger (1944) dedicated an entire text to the same issue. Over time, despite the anti-vitalist tenor of scientific discourse, the rejection of reductionist explanations, especially those that declared organism and mechanism as equivalent, took many forms. This is not the place to summarize the variety of viewpoints eventually rejected as vitalist. But let us not ignore the rationality of some positions taken since the Cartesian revolution. Kant (cf. 1987) advanced the â€˜â€˜feeling of life’’ (LebensgefuÂ¨hl (1790). The unity between natural and historical reason implies what we would call self-organization, in the terminology of dynamic systems theory. Self-preservation as a characteristic of life comes up in Nietzsche’s Lebensphilosophie [1866, cf. (1886)]. With his focus on time, Henry Bergson (1889), to whose name eÂ´lan vital was attached, maintained that life is process [devenir becoming, cf. (1907)]. As he defined a â€˜â€˜creative evolution’’ (1908), he argued in favor of a dynamics of evolution based on indetermination. This is what life â€˜â€˜contributes to the process’’ [1896 (cf. 1994)]. Whitehead, influenced by Bergson, affirmed, in addition, a â€˜â€˜principle of process.’’ The connected multiplicities making up an organism constitute not the Cartesian subject, but a superject, within which life is manifested (1929). As a matter of fact, these and quite a number of other contributions prove to be more resilient than the articles and books written about them with the express goal of debunking the vitalist perspective. I mention this in full cognizance of the fact that a scientist labeled a â€˜â€˜vitalist’’ is usually placed outside the scientific stage of debates (practically blacklisted, i.e., not fundable). In considering the fascinating change of focus from the physical to the living, can we ignore the fact that the sciences of the living— the â€˜â€˜bio-’’ sciences—emerged in the last 20 years precisely due to the failure of Cartesian reductionism and determinism to fully understand and explain the living? It would be ahistorical to ridicule vitalists. When one reads the writings of one of the leading vitalists like Driesch, one is forced to agree with him that many of the basic problems of biology simply cannot be solved by a philosophy as that of Descartes, in which the organism is simply considered a machine. The developmental biologists in particular asked some very challenging questions. For example, how can a machine regenerate lost parts, as many kinds of organisms are able to do? How can a machine replicate itself? How can two machines fuse into a single one like the fusion of two gametes when producing a zygote? No competition with, or denial of, Cartesian method is intended. A necessary reassessment of the epistemological framework of understanding the world as heterogeneous, functioning at various levels of complexity is appropriate at this moment. 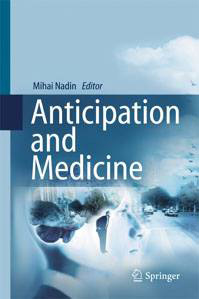 My own position—to be articulated in the progression of the argument leading to the understanding of anticipation as a characteristic of the living—presents a complementary perspective between reaction and anticipation. Indeed, all living entities, from the monocell, to vegetation, to insects, to the most complex forms (the human being, for instance) are embodied in matter. The laws of physics (themselves subject to progressive refinement as our knowledge about the world advances) apply without any exception to the living, without fully expressing its more complex behavior. Therefore, one has to conclude that they explain only the unambiguous physics of life, but not life itself, in its ambiguous expressions. This is what prompted Kant’s criticism of Newtonian mechanics, and this is what Nietzsche, Bergson, Whitehead, etc., and later on Schrödinger, Bohr, Elsasser, Rosen, and quite a few others raised. None denied physics and chemistry; and none denied physics- and chemistrybased new sciences, including information science and its various applied fields (such as computer science, artificial intelligence, virtual reality, etc.). They only took note of the fact that reaction—the sum total of how the living would behave if the laws of physics fully characterized it— is only a part of what defines the living. Schrödinger put it in clear terms: â€˜â€˜Enough is known about the mathematical structure of life to tell exactly why present-day physics cannot account for life’’ [cf. â€˜â€˜What Is Life?’’ in Nature (1929)]. Kepner (1934), in the address of the retiring president of the Virginia Academy of Sciences, acknowledging the purposiveness of life (and implicitly of social life, a â€˜â€˜correlate of life’’), noticed that whereas physicists needed only the phrase â€˜â€˜as a result of’’ in referring to their facts, biologists are compelled to use the phrase â€˜â€˜in order that’’ in order to frame data that could not be otherwise explained. Therefore, along the notion of complementarity advanced by Niels Bohr (1949, pp. 200– 241) (and which was explained above in â€˜â€˜Epistemological sectioning’’), I suggest that the living can be described as the integrated dynamics of reaction and anticipation. The analogy, in terms of complementarity as a universal principle of life, is to the corpuscule-wave nature of light, which, when it was proposed, faced no fewer reservations than the concept of anticipation, introduced by Rosen (1985a, b) and Nadin (1991a, b). But to give meaning to a principle of complementarity in which reaction—well defined in Newton’s mechanics— and anticipation need to be understood in their unity, I need to briefly elaborate on anticipatory systems. Within physics- based explanations, the current state of a system is determined by its past and is deterministically well defined, i.e., non-ambiguous. An anticipatory system is a system whose current state depends not only on previous states, and eventually its current states, but also upon possible future states (Fig. 5). Between memory in the physical realm and living memory, the distinction is similar to that between storing a picture and storing the instructions for making the picture, actually many pictures. The physical embodiment of the living (not unlike stones, or pieces of metal, etc.) stores information as matter is literally changed. A wound is the vivid memory of a physical injury. The living learns—this is what brain science defines as brain plasticity, i.e., the capability to adjust, re-organize, as it partakes in all sorts of practical experiences. The living, within anticipation dynamics, heals itself (the self-repair function). As a physical entity, the living has a degree of complexity fully characterized by reactive behavior described in the laws of physics. When we have to account for higher complexity— the threshold beyond which reaction alone can no longer explain the dynamics—the anticipatory component is integrated in our understanding. There is no doubt that the living, as a complex system, allows for partial descriptions that conform to the reaction model. For example, we can attach to the living a number that defines its current weight, or height, or temperature. But there is no way we can build from such partial descriptions—no matter how many—a holistic entity as complex as life. The stone in Fig. 2 will always fall the same way, under the same initial conditions; a human being will always fall in a different way. From Fig. 5 Anticipatory system as unity of reaction and anticipation quantified discrete aspects of the living, we cannot infer to the complementarity of reaction and anticipation as the origin of its dynamics. It is exactly this assertion that I had in mind when I wrote that statements challenging Cartesian reductionism—dynamics explained on account of action— ought to be submitted to as rigorous evaluation as Cartesian thought was. With the dialectic unity between reaction and anticipation, we proceed not from a formalism (as Rosen (1985a, b, pp. 165–203), for example, did), but from the epistemological consideration of natural systems (in the traditional understanding of natural science as Simon referred to it) and their specific, non-reductionist dynamics. 6 Synthetic life: is it capable of aesthetic expression and ethical performance? Aesthetic and ethical expression, as anticipatory expression, i.e., realization in the large domain of the possible, are among the many factors underlying evolution. Indeed, as Darwin suggested (cf. On the Origin of Species by Means of Natural Selection, 1859), â€˜â€˜It is not the strongest of the species that survive, nor the most intelligent, but the ones most responsive to change.’’ Adaptive performance is essential. Such performance is not the result of reactive behavior, but rather of anticipation against the background of reaction. Given the fact that all that exists changes, should we set evolution, or at least evolution-like behavior, as a goal for the artificial? As a matter of fact, technologies with adaptive characteristics, inspired by the combination of the living, are conceived, produced, tested, and deployed for quite a large array of applications. In particular, adaptive features are integrated in products for people with physical disabilities (limitations to vision, hearing, mobility, etc.). They offer capabilities of interaction adapting to a person’s particular needs and possibilities. Recently, adaptive interfaces were developed on the premise that a user model based on patterns of user behavior can guide the selection of features. Such technologies reflect the understanding of the need to transcend the here-and-now mechanisms, the â€˜â€˜trivial machine’’ behavior, ill-suited to function over a longer time, i.e., within a world of many changing variables. To reach life-like performance over discrete intervals is possible even within the limitation of Cartesian reductionism and determinism. Typical interfaces, such as those available within the desktop metaphor, perform in such a manner. That such life-like performance does not translate into autonomic aesthetic performance similar to that of the living (in particular, the human being) is the result of the fact that only at the level of evolution per se, not within a pseudo-evolutionary mechanism, does the need for aesthetic performance emerge. Indeed, the aesthetic dimension of the living is consubstantial with living. It is not mere cosmetics, i.e., not an added layer irrelevant or only marginally relevant to the living. Rather, it partakes in the dynamics of the living. The entire issue of the continuum of living, i.e., from conception to birth to maturity and death (return to the physical condition) is one of autonomous anticipation, expressed in particular as aesthetic anticipation. Natural selection is aesthetically conditioned [see, for example (Enquist and Arak (1994); Descimon (1992)]. We have to date rich sets of data (on fish, birds, monkeys, and human beings, among others) documenting how aesthetically driven choices have led to the viability of entire species. Fitness turns out to be not only physical, i.e., corresponding to the domain of reaction (forces at work, such as in preying animals, where the strongest has better chances), but also anticipatory. As the environment, in its unity, evolves, the living adapts, and usually in a manner that, in retrospect, appears as anticipatory [cf. for example, McFadden (2000), p. 46]. Aesthetic performance is part of the adaptive process and is itself often anticipatory [cf. Pawlowski et al. (2008)]. Motor and sensor changes, expressed in characteristics of motion, are not independent of each other, and even less independent of the cognitive. The extreme sensitivity of sensors as part of the living, their unparalleled specificity, speed, and refresh rate are only part of what defines the living as corresponding to a threshold of complexity by many orders of magnitude higher than the physical. Even relatively simpler organisms (viruses, insects, worms) display anticipatory characteristics that cannot be reduced to the descriptions of physical phenomena. Lock-and-key molecular recognition (BoÂ¨hm and Schneider 2003) testifies to intricate behaviors that imply aesthetic components. For instance, the sense of taste and pheromonal activity are of this nature. Indeed, the living is the expression of the complex whole. But after all is said and done, ethics, unlike aesthetics, is anticipatory in nature: which ethical considerations entail the promise of the highest return (i.e., one possible future)? As a construct, ethics is not a natural characteristic, rather an outcome of evolution associated with the complexity expressed in the social life of the human being. But once ethics emerges, it, like aesthetics, becomes a constitutive part of the living entity called the human being. From the vantage point of the human being, ethics becomes an expression of adaptive processes corresponding to higher levels of complexity than those at the threshold at which life is distinguished from the physical. With all these in mind, we are, volens-nolens, confronted with one of the most intriguing attempts to devise a technology that will transform the physical into the living—the old problem of making life from non-life, a history too long to be told here. Let us only take note of ideas such as spontaneous generation (life emerging from non-life as a result of abiogenesis) or life coming from outer space (panspermia). Venter et al. (2008), the scientist entrepreneur who made the genome project the brand of his success, assembled a team of researchers, which had already constructed a synthetic chromosome. As the press (scientific and popular) reported, they used chemicals from which they stitched together a chromosome that is 381 genes long and contains 580,000 base pairs of genetic code. The DNA sequence emulates that of a bacterium, the goat pathogen, Mycoplasma genitalium. The synthetically constructed chromosome—this is the physical component— called Mycoplasma laboratorium, was transplanted into a living bacterial cell—this is the opposite, the living—and is supposed to take control of the cell, and become a new life form—the synthesis. This new life form is supposed to replicate itself and metabolize on the molecular substratum of the living cell into which it was transplanted. Synthetic biology, within which such attempts take place, assumes that, once the new life form is ready, all it will take to start a Darwinian evolution is the addition of nucleotides. For all it is worth, let us take note that one scientist wrote, â€˜â€˜This â€˜new life form’ is just reassembled parts’’ [cf. Gay (2007)]. I would be inclined to leave this subject entirely in the hands of scientists (so far, Venter is only the best known among them, but by no means the only one) trying hard to solve one of the most fascinating questions of all time. But once we address issues of anticipation as definitory of the living, and implicitly aesthetic and ethical issues of technology, it becomes impossible not to reflect upon the many implications of synthetic biology. In the final analysis, this is about understanding what life is. In a day and age of spectacular performance in the field of genetic engineering, many people have expressed worries about ethical issues ranging fromabortion, to cloning, to stem cell research, not to mention patenting nothing other than life (as Venter’s group tried). When life begins is of extreme importance to many people, and so is the ethics of human life vs. the life of other species. The minimal genome, as the smallest set of genes that support replication of the organism, which Venter et al. synthesized, corresponds to the reductionist model of Cartesian rationality. It simply says that in reducing life to such an elementary unit, we can now build up complexity in an additive manner. According to this view, a well-defined â€˜â€˜brick of life’’ should suffice to build from simple living entities to more elaborate organisms— or at least to start processes similar to those of evolution that eventually led to the world of the living as we know it. In the never-ending scientific debate on what life is, such a viewpoint was debated to the extent to which it was difficult to expect it to be resuscitated. As passionate as I am about science, and as adamant in refusing religion or religion-like considerations to interfere in the pursuit of knowledge, I cannot escape the urge to articulate my own scientific hypotheses regarding the matter. The synthesis of life from non-life, of the living from the physical (inanimate) is possible to the extent to which anticipatory characteristics, definitory of the living, are part of the endowment of artificial life. As a matter of scientific principle, I refuse to follow in the footsteps of those who state that synthesis of life is an impossible endeavor. Science is never an expression of negation, of impossibility. (Just to avoid misinterpretation, I cite Popper; his falsification notion does not characterize science, but the validation of scientific hypotheses through experiments.) Science affirms goals and methods. â€˜â€˜It is not possible’’ is a formulation science never endeavors. 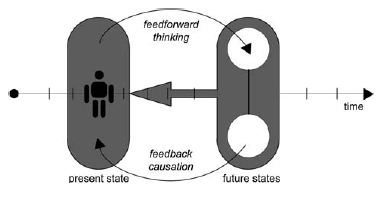 The possibility to build anticipatory systems is connected to reaching the threshold of complexity that makes them possible, and probably necessary. I do not eliminate the possibility, but I take the occasion to formulate an even broader question: observed over a long time, human beings appear to the observer as complexity-reducing entities. Cartesian reductionism exemplifies this condition; it became our modus operandi. To understand what goes beyond our comprehension, we try various methods, the Cartesian still being the method of choice, in order to access the unknown stepby- step. With respect to the living, we continue to investigate molecular levels, genetic processes, membranes, brain activity, synapses, etc. The difficulty, of course, is to preserve complexity, not to reduce it. Or, in the other formulation I used in this study, to handle ambiguity and non-determinism. At this moment in time, synthetic life seems seduced by the promise of a minimal description, based on which, pretty much as in a generative grammar, it could generate the larger â€˜â€˜sentences’’ of life, and even the â€˜â€˜book’’ of life. But is there a path from lower complexity to higher complexity? From entropy to negentropy? From well defined to ambiguous? On a larger scale, is it not possible to formulate a different question, relevant to our understanding of the living (the natural) and the artificial? That question would be: can we really generate complexity? Wolfram (2002), with his New Kind of Science would be inclined (to put it mildly) to say â€˜â€˜Yes’’—having in mind computer-generated complexity, which is not the same as living complexity. The many implications of this question (including aesthetic and ethical aspects of technology) might justify the effort to look for and to formulate some answers, even beyond those published by the NKS Community. At least in respect to aesthetic artifacts, there is a lot we can consider. The synthesis of life from non-life ultimately means to endow the synthetic with anticipatory characteristics. For this to actually be accomplished, two minimal requirements must be met. The first relates to how the possible future informs the present. It is an informational process, in which the future is actually continuously modeled by the organism, as a realization in the very large space of possibilities. My own concept is that of a multitude of such models, each triggered by past and current experiences, which in turn translate into possible paths. Let us take an example (for the sake of illustrating the argument, but not reducing it to the illustrated) (Fig. 6). Of course, one or two examples are not enough for concluding in regard to how anticipation takes place. But the logic of the explanation is simple: the clock defining our activity (airplane schedules are given in real time) and the clock of a process, or several processes, searching ahead of time, in the future (which connection is appropriate for the goal of arriving at a desired time), have a different rhythm. Biology informs that within each living entity, we encounter a variety of clocks. Some tick according to the day-and-night rhythm, others to the rhythm of the seasons, and yet others at the molecular and genetic levels, faster or more slowly (depending on their respective functions). 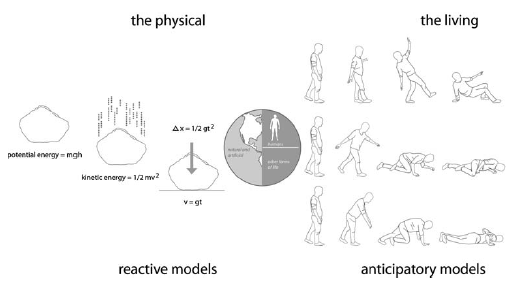 It is only on account of this variety of clocks that an anticipatory model can unfold in faster than real time and inform anticipatory behavior (such as collision avoidance, successful return of a fast tennis serve, falls that prevent broken bones, etc.). Obviously, the simpler the living form, the simpler the anticipatory behavior. Only if the synthetic form of life is endowed with at least two clocks—one in charge of current functioning and Fig. 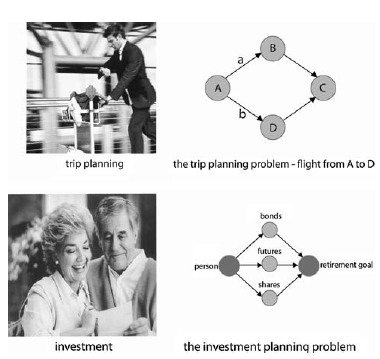 6 Choices affecting the outcome (arrival time or return on investment) are models from among which one is selected in anticipation of a successful course of action one faster by some order of magnitude—will it be possible to draw comparable processes, and as a result, inferences to a future among the many to be encountered could be made. Evidently, there is no aesthetic or ethical component to be considered in simple forms of living. Only when the constructs aesthetics and ethics, as an outcome of practical experiences of human self-constitution, become part of the experience—efficient activities are aesthetically optimized, interactions with others are ethically validated—can we identify them as such. If synthetic life is made possible, in order to qualify as life, it is bound to evolve. In view of such dynamics, sooner or later we could associate to its behavior characteristics definitory of our constructs called aesthetics and ethics. Let us not ignore the fact that aesthetic processes are driven by the end: the artist works his or her way back from the virtual finished work—as he or she anticipates it—to what might actually lead to it. The brush is slower than the mind guiding it toward what is ideally finished and only waits to be revealed. The same holds true for music (the composer â€˜â€˜hears’’ before it is â€˜â€˜sung’’, before it is â€˜â€˜extracted’’ from an instrument or embodied in some notation. In terms of ethical concerns, to ascertain something like the value of cooperation or respect for the environment is to realize, ahead of time, what could happen in the absence of actions leading to cooperation or environmental protection. This is anticipation at work. The details of the process encompass not only predictive models (based on previous experiences) but also on realization in the large space of possibilities. The second requirement is the sense of purpose—or, in the terminology of causality, what Aristotle defined as the final cause (the so-called teleological). We already referred to it as we took note of the fact that each organism appears to an observer as having a purpose, a finality (reproduction, metabolism, self-repair). Purging animism from science meant for many the simultaneous elimination of teleological, i.e., finalistic considerations. Yet the living, observed in all its manifestations, has a teleological dynamism: from reproduction—without which there is no way to define evolution—to self-preservation, social organization, and politics, all we do is driven by purpose. That we can distinguish deterministic actions as well as anticipatory processes within the dynamics of the living was explained within the perspective of a complementary understanding of what life is and how it expresses itself. More important is the dynamics of identity, i.e., the continuous making of oneself as distinct from all others with whom one interacts. There is an underlying Why? beneath everything we do. In this never-ceasing interrogation, there is a sense of direction. If we now want to generalize from the living to the synthetic living—the goal of all those intent on synthesizing life from the inanimate—we cannot ignore the expectation of purposefulness (Fig. 7). Once upon a time, creativity was associated exclusively with divinity (in its many expressions in different cultures). In this view, the world was created, the human being was created, and so many other things were created, that is, made out of nothing or out of something (earth, mud, fire, air, etc.) that was not endowed with life. Slowly, creativity was assumed by the human being as its most definitory characteristic, exemplified by works of art, architecture, science, social progress, etc. But once we associate creativity and anticipation, we advance an alternative path, that from the limited dynamics of the physical to the rich dynamics of the living. The world is making itself, in a process of self-organization that never ends. And so is the living, in particular, the human being. We are what we do extends across the living. Now, again, the challenge is to create life from non-life; that is, we are trying to be the makers of life from the physical. If there is a test for the success of the endeavor, it would not be unlike the success of life created by divinity or through any other explanation of the world, i.e., to become itself creative. Anticipation being the grounding for any life form of creation, i.e., extension into the future, the synthetic living ought to have what it takes to anticipate: a minimum of two timescales, two clocks ticking in a different rhythm, and, just as important, a sense of purpose. The challenge to meet these two conditions is by no means trivial, even for the simplest embodiment of life. But for those who try to attach their name to a patent to life, i.e., creators of new life, this should come as no surprise. The author would like to acknowledge feedback from Lotfi Zadeh, Frank Dufour, W. Jay Dowling, and an anonymous reviewer. This research was supported by antEÂ´ -Institute for Research in Anticipatory Systems, ATEC (Arts and Technology at the University of Texas at Dallas), and the QF Foundation.